UVA led #2 Florida State 13-7 at the end of the first quarter with the ball. Before a minute had passed in the second quarter, the ‘Noles had the lead thanks to two Virginia miscues, setting the table for the Seminoles to post an otherwise tough 34-20 win in Tallahassee, Fla., Saturday night. The Cavaliers (4-6, 2-4 ACC), dropping their fourth straight game, got three touchdown passes from Greyson Lambert, two in the first quarter, but it was two awful throws from the sophomore signal-caller that put Virginia behind the eight-ball. After a long punt pinned the ‘Hoos inside their 5, Lambert, on the first play of the ensuing drive, was intercepted on a pass in the left flat by Terrance Smith, and the ‘Noles scored on the next play on a 3-yard run by Karlos Williams. 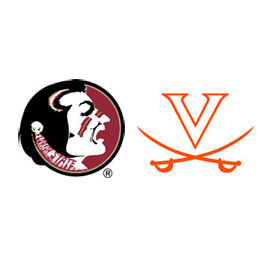 The next play from scrimmage for Virginia went about as well, as Lambert, throwing a pass to Taquan Mizzell behind the line of scrimmage, failed to connect on the pass, which because it went backwards was ruled a lateral recovered by FSU defender Eddie Goldman at the Virginia 22. Jameis Winston connected with Rashad Greene on the next play to put the Seminoles up 21-13. A Winston 4-yard scoring run made it 28-13 at the half, but the Cavs battled back to make it interesting, getting a Lambert-to-Canaan Severin 23-yard TD pass to close to 28-20 with 8:14 to go in the third. A pair of Roberto Aguayo field goals, the second, a 40-yarder in the fourth quarter, that hit the left upright before sneaking through the goalposts, put FSU up two touchdowns. Virginia had one last chance, driving inside the FSU 10 before a bizarre sequence that saw the Cavs lose two yards on a dive play, lose another three on a wildcat play with third-string quarterback David Watford and then come up short on fourth-and-seven on a screen pass with 5:47 left. Florida State outgained Virginia 376-257, with the Cavs only able to gain 37 yards on the ground on 32 carries. Lambert had maybe his best day, or at least his most efficient, day at QB for Virginia, completing 20-of-35 passes for 220 yards and three TDs with the one interception for a passer rating of 132.5. The Virginia D did a nice job containing Winston, who was 22-of-35 passing for 261 yards and one touchdown, with two first-half interceptions and a passer rating of 123.5. FSU ran for 115 yards on 39 carries. Both teams committed three turnovers. Virginia has a bye next weekend, and returns to action on Nov. 22 at home against Miami.